One year ago my life changed forever when I saw the faint pink line on the pregnancy test. Since I had graduated college only 6 months earlier, being a stay at home mom had never even crossed my mind. I’d worked 5 years to obtain that expensive piece of paper. Surely, I’d use it right? Wrong. I’m hanging out with my friends at God-Sized Dreams today. I’d love it if you would join me. This entry was posted in Dreams, God Sized Dreams, Growth, Marriage and Family, Motherhood, Uncategorized and tagged Dreams, Growth, seeds4yoursoul on December 11, 2017 by Lovelle Gerth-Myers. For the past 5 years I have had an air freshener on my rear view mirror. It’s a cross with big blue letters that read, “Be still and know that I am God.” The smell is long gone and age has definitely set in but every time I think about taking it down I just can’t bring myself to do it. You see, my high school librarian gave me that air freshener as a graduation gift and it was with me in some of the toughest situations I have ever endured. I would look at it when I was homeless or driving to one of my many jobs. I would glimpse at that cross when I was in pain wondering why I had to go through life alone. It was my reminder that He was with me through it all. This air freshener would tell me that God was in control and I need not worry. I still look at it daily and it means more to me now than it ever has. I have walked through the wilderness and God has brought me to my promised land. I am writing this story because I want you to know a very important truth: You never know who you impact. It took me years to truly understand how much my librarian helped me and it took me even longer to voice it to her. My librarian and quite a few high school teachers walked along side me in some pretty tough mud that I’m sure they weren’t certain I would get out of. But guess what??? They also walked with me through my promised land too. One of my favorite memories is when three of my teachers crowded around me for a picture on my wedding day. They believed in me and that is the faith that God has called us to live. Being still and knowing who God is doesn’t mean that everything is perfect and it certainly doesn’t mean we are in control. It means that we trust in a God that knows the end result even if it takes years to fully develop. My job is a hard one. I see kids in some of the worst situations. Some leave to a happy place while others leave in handcuffs. No matter what, I don’t know what the end will look like for any of them. When I drive home I look at that cross and remember that I serve a God that knows every one of my kids’ situations. What situation are you dealing with today? What uncertainty do you see? Trust in God and know that He has everything taken care of. This entry was posted in Growth, Truth and tagged Faith, Growth, seeds4yoursoul on August 5, 2016 by Lovelle Gerth-Myers. I walked to the stage in amazement. I never thought I would get here but I did. They announced my name and gave me my diploma. I could hardly hold back the tears. I worked so hard for this. I almost gave up so many times because it was so hard. I shed so many tears trying to get to this place right here, right now. 6 years ago I was isolated and alone. I had dropped out of high school for over a year but managed to graduate on time by the grace of our Heavenly Father. College seemed to good for a girl like me. That’s where the smart people went. You know, the ones with parents that believed in them and actually prepared them for it. I got shoved into a community college and until the first day of class, I didn’t know that college had a different schedule. I didn’t realize that you didn’t go to school from 8am-3pm. Talk about a wake up call. I felt so different and stupid compared to the other kids who actually seemed somewhat put together. There were so many nights with little sleep because school and working full time didn’t always mix. I continued on and pushed myself forward, looking toward the finish line, uncertain of my future. The Lord is so faithful. Now I have parents and a huge support system cheering me on. Somehow they knew I could do it even when I didn’t think I could. They never let me give up. They listened to my cries and cheered me on all the way to the finish line. As I held that bachelors degree as tight as I could with my cap and gown on I was so full of thankfulness. I am thankful that the Lord took a broken girl and did the impossible. He managed to make her a graduate not once, but twice. He saw something in her that she didn’t know she had. He pursued her with everything He had and He constantly reminded her that His ways are no limit to her circumstances. He gave her an amazing husband. He proved to her that she wasn’t as stupid as she thought she seemed. He showed her that she was worthy. Everything that was taken from her, God in His gracious love redeemed. That my friends is what my college degree means to me. 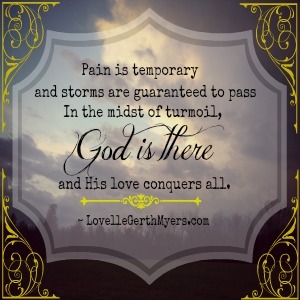 This entry was posted in Dreams, Fearlessness, Growth, success and tagged encouragement, Faith, Gods truth, Growth, Jesus, seeds4yoursoul on May 11, 2016 by Lovelle Gerth-Myers. It was a bright and sunny day and the temperature was perfect. Although I felt like winter lasted forever, the amazing weather I saw made me think that things were going to lighten up and boy, was I excited. I was ready for the warmer weather, and all that came with it like trips to the lake, pretty flowers, and walks outside. I looked at my phone to find a notification from a local news station informing me that the area was under a severe thunderstorm warning. I scoffed at my phone in disbelief because from what I had observed, there was no way a storm was possible. The weather was amazing and there wasn’t even a cloud in the sky. A couple hours later the meteorologist proved me wrong, and the storm came down hard. I was reminded that life is full of up’s and downs. The adversary has undesired surprises hidden in every corner. One moment things are fine and then bam, you are hit with an unexpected expense or sickness. Happiness is drowned in the midst of a storm. Through all the hardships that come from life, I am so thankful that my God is in control. This entry was posted in Uncategorized and tagged Be Still, confidence, Contentment, encouragement, example, expectations, Faith, freedom, God, Gods Plan, Gods truth, grace, Growth, happiness, Healing, Heart, Home, humble, Jesus, leadership, leading, lessons, Life, life lessons, Love, mercy, peace, shine, soulseeds, storms, Transparency, Trust, Truth, Unknown on April 24, 2015 by Lovelle Gerth-Myers. I jumped out of bed as quickly as I could. Normally 6:17am hardly qualifies as late on a Saturday morning but in this case it did because I was supposed to be at the starting line of my half marathon that was thirty minutes away. Even though the race didn’t start until 7am, it was necessary to get there 30 minutes early because there were 2,600 other runners that needed to line up too. Thanks to my alarm clock I was now running extremely late. I had less than 15 minutes to reach my destination. My late schedule caused me to run out the door without eating anything or even going to the bathroom. This meant that I had to run 13.1 miles with an empty stomach and full bladder. Running a half marathon is hard enough. Frankly, I didn’t need anything else to make it worse. As I stood there in running position, waiting on the race to start Paul’s words from 2nd Corinthians 12:9 began to echo in my head. Over and over again I heard. So when the race began I held on to those words. As my feet hit the pavement I thanked God for my ability to run and begged him to help me get through this race. I finished the race in awesome timing. My goal was to run the half marathon in 2 hours in 15 minutes. I did it in 2 hours and 14 minutes. Yup, I beat my time by one minute even though I was running on no food. 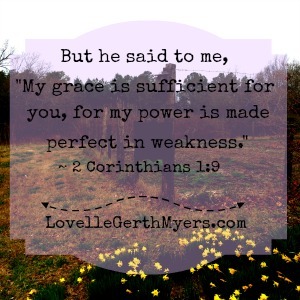 God’s power worked in my weakness. He helped me through the whole thing. Have you ever had one of those moments when you just thought that you couldn’t do it because you didn’t feel strong enough? Well heres the thing, you aren’t strong enough, but your Creator is. His power works best in your weakness so sit back because He has got your back. This entry was posted in Uncategorized and tagged Be Still, beauty, Change, confidence, Contentment, encouragement, example, expectations, Faith, freedom, God, Gods truth, grace, Growth, happiness, Healing, Heart, Home, humble, Jesus, leadership, peace, shine, soulseeds, Transparency, Trust, Truth on April 3, 2015 by Lovelle Gerth-Myers.